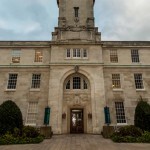 The University invited five companies to present their ideas for the expansion and re-development of the existing lower ground café, situated within the prestigious Trent Building, University Campus, Nottingham. The Grade 1 listed building, completed in 1928 was opened by His Royal Highness, King George V. It holds considerable status within the campus and for the University and region as a whole. 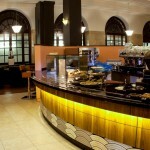 The Art Deco style of the building inspired the decorative and tasteful theme for the interior treatment of the new café facility, taking the huge arched windows on both sides of the space as the reference for a design motif which was used to create a ‘bespoke wallpaper’ design and features to dress ceiling rafts and the main foodservice counters. The colour palette is typical of the period, as are the opulent materials, lighting and visual references to ladies fashions of the era, which are used within the soft screening features between zoned seating areas, creating interest and a sense of privacy throughout the space. 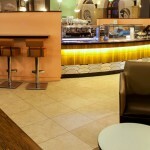 Our design proposed the removal of a central wall, which separated the existing café from an adjacent lecture room, and the excavation of the floor within both spaces to accommodate mechanical services to suit the new facility’s functional requirements. 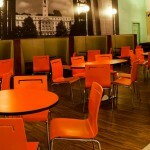 ‘Trent Café’ now comprises both spaces with a central ‘open plan’ food preparation and service area. The project was designed and built within 11 weeks, meeting the Clients budget and programme for the completion of the project.